The Tōkyō All Star Orchestra Otoko Namida No Komori Uta Favorite Japanese Instrumentals Cord International/Hana Ola 2002 CD "Lullaby of a Man's Tears"
The Nails Things You Left Behind single RCA 1986 12" "Popstand Stylee Remix"
The Photos There's Always Work single Rialto 1983 12"
Leroy Holmes and His Orchestra The High and the Mighty single MGM 1954 45 "Whistling by Fred Lowery"
Hello, Joe. Hello, Lee Michaels. morning Joe! Nice kick-off track! Hey all! LOVE the guitar intro to this! Hey, Joe! Hi, all! Everybody ready for today's Clay Pigeon-athon? Who is the man? Joe. Damn right. Was about to praise the Lee M, but was not quick enough on the draw. But now this Shaft -- I just gotta ring in and say hell yeah. when there's palm trees all about? Joe is one baddddd mothahh - shut yo' mouth! Good morning, friends!~ Thanks for joining me today. Hey Joe. Anyone seen Mood Indigo or Froth on the Daydream as the book translates. @ doca - 4 hours of Dusty! Woo! But I'm talkin' 'bout Joe! There's a great? Burt Ward track on Irwin's Premium this year. Brian UK what is it? Bob you're here early. You off today? @mains hum 'Boy Wonder I Love You'. Truly crapulous. Is it my computer because the Now Playing at the top of the page keeps leaping about to previous tracks. Nice Bob, I too try to schedule work around FMU. Can you get home for the 6 shows now? Mateo! Met him at Rooftop Films early this past summer. What a -- um -- unique character he is. @marcel, nahh I'd have to get here by 8:30 to make the 6pm slot.. that's not happening. @BOB: Ai, yes too early. Morning Joe and fellow McGaskonites! Hey, Rev and thedunkel and Marcel and Parq and bobdoesthings and Brian and Rectitude and common and VPriceless and doca and fleep and adrian and DCE and duke and Steve and Fuzzy and P-90 and mainshum! Hey right back at ya Joe! Ah, already clickied! Awesome groove on this Angles track. Hey Joe! These Tokyo cats are just nuts! Bonjour Joe McG and listeners extraordinaires ! dont ask me why but there was some charli xcx progression in that tokyoite fanfare. salut pierre. long time no see. Perfect balm for a not-quite-Friday morning! got to play with morphine once...long ago. so great and such nice people. After all, it's Thursday, Thursday, Thursday! @common: really? how it happened? @common: Tell us that story! @ common - wow - that's really cool! i was in a band in nc. i shoulda said we opened for them. it was our first show as a band, too. just us and them in a real armpit of a club called the somewhere else tavern. i was pretty nervous and blown away. but we drank whiskey together at the bar! why didn't you name your show "The McGasko Fiasco" ?? I mean Surface Noise is top notch.. but .. com'on! @common - that's so cool! Hey, if your suddenly discovering which song you wish you'd played gets a double shot o' Morphine, that's fine by me. There should be no regrets about playing Buena. adrian and vp and doca and joe: it was really cool. glad i got to experience that. She was in The Very Long Engagement. Most attractive woman I have seen in a leg iron. the morphine album reminds me good times. circa 93 it was a 'big' band. like 5 broadcast a day on music channels. Back from vacation, at my new job and ready to PARTY! audrey tautou is really cute but she's got this voice and this speech that contrast a lot with her being a chanel egery... maybe it is not obvious once she switches to english, but shes slightly, hm, vulgar, in a way. Hey, Greg and bibi and Sigurdur and Jeff and Fernando and pierre and Mike East and ChrisB. and maestroso and SeanG. and kym! Always loved the violin(s) in the Raincoats. She can be my vox vulgaris! yep, clickstarred this lost little girl. Boo from the isthmus. Torrential rains last night. REVEREND TURNIP BIKE RIDER ! the Nails, about that, how come bitting your nails are not adviced, but clipping them is suuuch an annoying thing to do ?? why am I hearing "Buzz Aldrin's Wife?" if the bassline is your spine, it is a fully working spine. never heard my spine is the bassline! so good! "poseur" = Canadian or English speaking Euro poser? and one fingers' ola for single file. one. That JUST may be the joke Bob. Yes, it retains a stronger connotation in english when using the french spelling/pronunciation. But it's essentially the same concept. Yeth, there'th alwayth work. Thupport the fatht food workerth thtrike! @Thatan: Say, have you ever been to the isthmus? I remember being so jealous of Debi Mazar when she had Coati Mundi over for dinner on her cooking show. @Cecile: What did Coati cook? The ithmuth? I like the ithmuth! He just ate amazing food that Debi and her hottttttt italian husband cooked. And looked amazing. He had a porkpie hat and suspenders. until I got more older and depressed, I usually preferred the Box Tops to Big Star. He and Kid still have a lot to teach the youth. It's nice to know they still play out. I've never seen "The High and the Mighty" but Leonard Maltin says it's the granddaddy of airplane disaster movies. I have striped gray, purple, white and pink hair, and don't smoke. But the balcony in Germany sounds like a place I would like to be. But what about the Heidi braids? and brown, gray, purple, white and pink and brown hair. The only braids around here are pretzels. @ Cecile - kudos on the hair color and the smoke-free thingy. stop fooling around, cecile, and get the balcony back now. it's like how people have a "face for radio". RadioFace. Sounds like a RadioHead spin-off. coolness, Odai! Welcome! Love me a Dreadlock Holiday in ol' Jamaica! reminds me of 'friendface'. some old IT crowd jewel. Big day today for Ms. Pi ! Is that 20/20 an Earl Mankey production? Sounds great. I know VP! I have planned my day around it. Yes, Ce! That and 4 Hr. Clay-A-Thon! or as Mad Magazine put it, "Poop-side-down Adventure". Man, that was like a group cheer! '71 with the Procol, originally. I saw Airport as a wee child and was freaked out. I think I would find it hilarious. Is that Kevin Ayers and The Whole World I hear in the background? Tomater is Icumen In. Lhude sing Goddamm. I'm gonna go! I love KGB. Favorite bar in Manhattan. I mourn for no Fabio, but a lethal dose of Pigeon will ease the pain. It's also Pi-Day on the Fun Machine, so I may need to score some interns/slaves to fetch me coffee. Not going anywhere. Hey joe listening while delivering these magazines. i thought it was ayers rocks. They say the Irish gave the Scots the pipes. But the Scots didn't get the joke. If you heard them though the mists of Culloden Moor, it would scare the crap out of you. pipes are everything but scottish initially. i learned that not long ago, though i lived there for a year. shame. Tatws are the Welsh would say. "She didn't know a bit more than nothing". Perfect sense. Wow I let out a WOOO WEEEE! 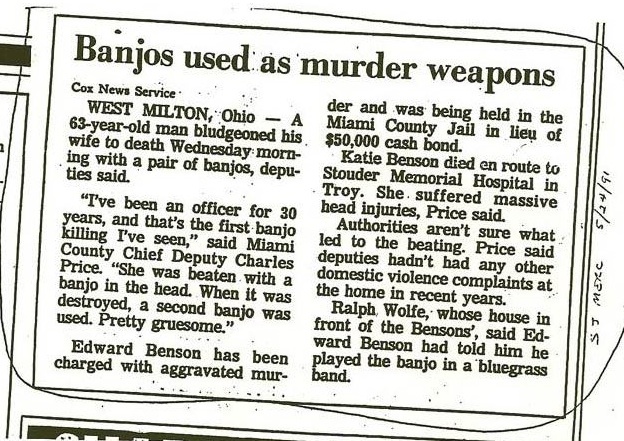 Right as the banjo man did it! Is this the guy who does the voice on squidbillies? Hearty White's cooler older brother. Jim Tom Hedrick has the best accent and dialect. My north Jersey gab sounds so much plainer. "ware" for "wire" - thick, baby! "Hit were nineteen and twenty, and times was tough in Matewan." Joe, put down that whiskey right now! Joe was just catching up on the show. Was a bit lit , err i mean i was late because i had to catch the buzz, uh bus. Got to get me down to the lower pasture, thar's some fences need fixing. Might be some time if the rains come. Bagpipe intervention. It'll clean you right out. I was choked when Mark's show was cancelled. I love this song about Mark Kozelek loving his dad. My pleasure, Brian! If anyone missed it, Kurt did a fantastic Beatles set last Friday full of Czech gems. Hi, Kurt! Any Edgar winter fans here? @Odai I o'd on it the week before the show was due. Stupid me. Not really true it does take concentrated listening. My favorite cover of this beatles song - thanks Joe! the server is letting me down today. Heya Joe and others. In time for the last 15, at least. He's a funny and odd animal, nearly 3 now. How's your doggie? Great thanks. Someone made me a belated birthday present. A cake in the shape of a beagle. Hi Joe, enjoyin' the show as usual. Am I hearing a Donna Summer tune? Hey, Mike! Love your Mick Jagger shirt! Carmichael, I was going to say I'll send you a leg but that sounds too much like the Godfather. Anybody having problems with the Flash pop-up? I've had to re-start it several times in the past hour or so. It's been bad today, Parq. @ Parq - sometimes the audio stream stutters - I just hit stop and then start again - OK. Moved to 128k about an hour ago, yes. J'regret, the pop-up is the only thing that works at all on my strangely Orwellian work puter. V Pri, that what I've been doing too. Thanks, BEAVO! And thanks everyone for listening today! See you next time. The mp3 stream has been near perfect. clan gasko's son, thank you. wow, I found earbuds that don't hurt. The Koss "Just for Women" ones. I don't think they are just for women, just designed well. But if that's what they think is girly, I'll take it.